After Paul Bishop’s excellent post on REH’s boxing stories turned my initial post on hard boiled private eyes into the start of a series, the next topic I knew I wanted to cover was westerns. And James Reasoner was the only person I considered to write it. 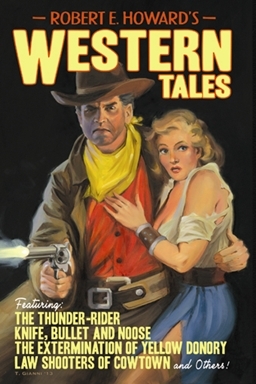 Historical fiction, noir and westerns: he’s excellent in all of those areas. 1914’s Robert E. Howard Days 2014 Featured Attendee is one of the best western writers alive. Let’s hit the trail! 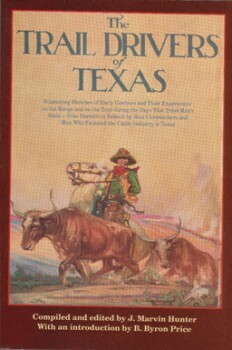 When Robert E. Howard was growing up in Cross Plains in the 1920s, it was entirely possible that some of the older men in town might have gone on cattle drives in their youth, as the great trails from Texas to the railheads in Kansas opened up after the Civil War and changed the focus of the Lone Star State’s economy. Whether a young Bob Howard ever listened to these old cowboys spin yarns about those days, we don’t know, but he certainly might have. J. Marvin Hunter’s classic book Trail Drivers of Texas appeared in 1927, and this volume might well have caught Howard’s interest, too, although we have no record of him ever reading it. Three saloons, one of which included a dance hall and another a gambling dive, stables, a jail, a store or so, a double row of unpainted board houses, a livery stable, corrals, that made up the village men now called San Juan. Howard’s protagonist finds an old enemy there, and before the story is over he’s accused of murder and finds almost every hand against him, so that he has to battle his way free even if it means wreaking total destruction on the town. This is an example of the trouble that waits for Texas men in these Kansas settlements, and that animosity is a theme Howard will return to in later stories. It plays a large part in “Knife, Bullet, and Noose”, a compact gem of action featuring Howard’s early character Steve Allison, also known as the Sonora Kid. After working as the trail boss of a cattle drive to Abilene, Allison is stuck in town waiting for the money a cattle buyer has promised him, but he also has some vengeful enemies there who are out to kill him. His sense of duty to the herd’s owner won’t allow him to leave until he collects the money, so he has to stay alive until then with would-be killers all around him. Clamor of cowtown nights… boot-heels stamping on sawdust-strewn floors… thunder of flying hoofs down the dusty street… yipping of the lean trail drivers, reeling in the saddle, hilarious after the thousand-mile trek… cracking of pistols, smash of glasses, flutter of cards on the tables… oaths, songs, laughter in all the teeming saloons and dance halls, louder yet in the plank-barred Silver Boot. The protagonist of “Law-Shooters of Cowtown” is buffalo hunter Grizzly Elkins, who played a supporting role in “Gunman’s Debt”. Howard must have had mixed feelings about buffalo hunters, since they serve as villains in some stories and heroes in others. Or maybe he just made use of a variety of Western characters however he needed them for a particular story. Grizzly Elkins (related to Breckinridge, surely) finds himself having to get out of town while a multitude of enemies want to do him in. He succeeds, of course, but not without a lot of brawling first. “The Dead Remember,” the last of Howard’s stories in which a trail town plays a significant part, isn’t really a traditional Western, although it’s set in Dodge City and involves a cattle drive. But its supernatural aspects nudge it over into the realm of the Weird Western. It’s also non-traditional in the manner in which Howard spins his tale, using a letter and several statements from a coroner’s inquest to tell the story, which is one of Howard’s last and in my opinion also one of his best. The theme that runs through all these stories is that the trail towns of the 1860s and ’70s were dangerous places. Dens of iniquity, even. In fact, they remind me very much of the cities into which Conan frequently ventures, hotbeds of wickedness in which a lone man often finds himself surrounded by enemies who want to end his life. The same thing applies to the Middle Eastern cities full of intrigue and menace that threaten the lives of Francis X. Gordon, Kirby O’Donnell, and other Howard heroes. You can even find some resemblance to the urban jungles in which two-fisted detective Steve Harrison batters his way through his cases. All of which, to me, fits right in to the theory that part of Howard’s genius lay in fusing elements of fantasy and history with the hardboiled and frequently noirish sensibilities of much of the crime fiction during the pulp era. Howard claimed not to care much for detective stories, but their hard-nosed attitude permeates his writing anyway. As Raymond Chandler said, “Down these mean streets a man must go,” and that’s true for Robert E. Howard’s heroes as well, whether the setting is Abilene or Shadizar the Wicked. Silver Spur nominee James Reasoner, best known for his westerns, has written over 200 books, including Texas Wind, Dust Devils and the ten-book Civil War Battle Series. His blog is worth checking out just about every day. I think Howard would have ended up as a western writer. I sure loved this post Bob. It is an interesting corner of history between the ranchers and farmers and bloody too. Ape – Other than having the good taste to ask James Reasoner to write about westerns, I can’t claim any credit for this post. That was all him.